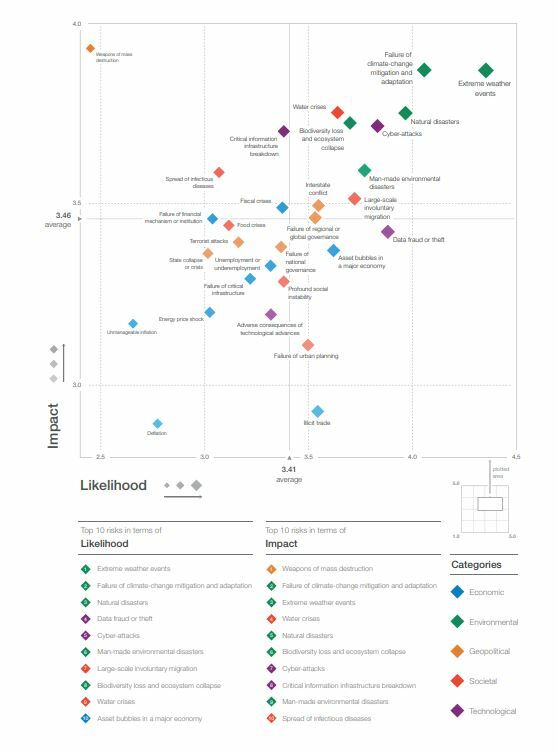 Each year the World Economic Forum (WEF) publishes its Global Risk Report to identify and analyse the greatest risks and issues facing the world. The 2019 report is based on the findings from the Global Risks Perception Survey (GRPS), which is completed by around 1,000 global experts and decision-makers. For the third year in a row environment-related risks represent the greatest threat, ranking in the top three out of five in terms of likelihood and fourth by impact. While the accelerating pace of biodiversity loss and ecosystem collapse were important concerns, the report also warns of the threats that climate-related risks pose to the global value chain. Disruptions to the production and delivery of goods and services due to environmental disasters are up by 29% over the last 7 years. North America was flagged as the region worst-affected, mainly caused by hurricanes and wildfires. The example that the report offers focuses on the US automotive industry, where only factory fires and company mergers caused more supply-chain disruptions than hurricanes. The rankings shouldn’t come as a surprise. 2018 experienced the fourth warmest year on record and the IPCC issued a stark warning on the consequences of an increase of 2°C of global warming. By disclosing climate change and environmental information companies can gain greater insight into the financial implications of climate change on their operations, performance and overall strategy. Furthermore, investors will be better equipped with the necessary tools to make informed capital allocations that facilitate the transition to a low carbon economy. Last year marked the first year of reporting under the EU Non-Financial Reporting (NFR) Directive, which requires large companies to disclose certain information on the way they operate and manage social and environmental challenges. Research by CDSB and CDP shows that only 44% of the largest European companies explain in their management reports how their business models are affected by climate change or environmental challenges. Where such reporting was mandatory before the NFR Directive, like the UK and France, companies seem to perform better. Even if the policies aren’t in place, there are multiple voluntary frameworks and standards that enable companies to identify and disclose climate risks and opportunities. Over 500 companies have now indicated their support for TCFD recommendations. We look forward to working with more companies in 2019 and beyond to combat climate change. Download the CDSB Framework to begin integrating climate and environmental information into your mainstream reporting practices.